238 pages | 5 B/W Illus. A UN report recently found that the Asia Pacific is the world’s most disaster-prone region. Indeed, considering that the region accounts for more than half of the total number of disasters in the world, building capacity and resilience to mitigate the devastating impact of disasters is a pressing task for local actors. This book takes a regional, multidisciplinary and multi-actor approach to improve understandings of how various actors respond to natural and human-induced disasters in the Asia-Pacific region. It examines the ideas and activities of four different categories of agents: civil society; military and state institutions; local cultural knowledge and the media; and economic initiatives, and these themes are approached from various academic disciplines, ranging from anthropology and cultural studies to economics, human geography and political science. The contributors draw their findings from a variety of countries in the region, including China, Fiji, India, Indonesia, Japan, Myanmar and Samoa, and importantly, focus on the interconnection between vulnerability and resilience. In turn, the book highlights how the nature and magnitude of disasters are influenced by social conditions, and aims to contribute to policies that prioritize development opportunities to enhance resilience. 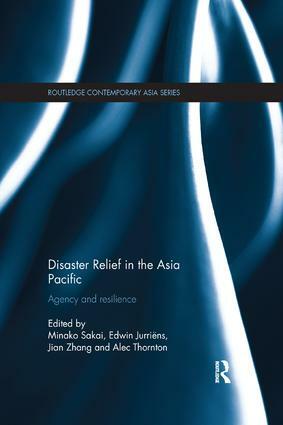 Further, it explores the complicated and multifaceted role of agency in building resilience, and presents a comparative framework for analysis and key findings from the Asia-Pacific region. The focus of this book on recent and ongoing disasters makes it a topical and timely contribution to the growing field of disaster management, and as such it will appeal to students and scholars of environmental studies, development studies and Asian politics. Minako Sakai is Senior Lecturer in Southeast Asian Social Inquiry, School of Humanities and Social Sciences, University of New South Wales, Canberra, Australia. Edwin Jurriëns is Lecturer in Indonesian Studies at the Asia Institute, University of Melbourne and Visiting Fellow at the School of Humanities and Social Sciences, University of New South Wales, Canberra, Australia. Jian Zhang is Senior Lecturer in Political Science in the School of Humanities and Social Sciences, University of New South Wales, Canberra, Australia. Alec Thornton is Senior Lecturer in Geography, School of Physical, Environmental and Mathematical Sciences, University of New South Wales, Canberra, Australia.